Have you heard that we LOVE cookies here at LJB? So how could I help but post this delicious recipe? It finally feels like fall here in NorCal, and nothing says fall like pumpkin, so again I post a yummy pumpkin recipe! These cookies are my favorite pumpkin cookies ever. Just a touch of cinnamon to add some depth but subtle enough that the cookies don’t taste over run by spices. You can just taste the yummy pumpkin and the melting chocolate. A delicious combination! Combine ingredients in order, adding one thing at a time and mixing to combine after each ingredient. Scoop onto jelly roll pan lined with parchment paper using a large cookie scoop. Bake at 375 degrees for 10-12 minutes. Cookies will not look completely done, but bottoms will be lightly browned. I have a similar recipe, but with no choc. chips….might have to add them! I’d love for you to come link this up at my Tuesday Time Out Party! yum! going to try these this week! This looks like a good recipe. 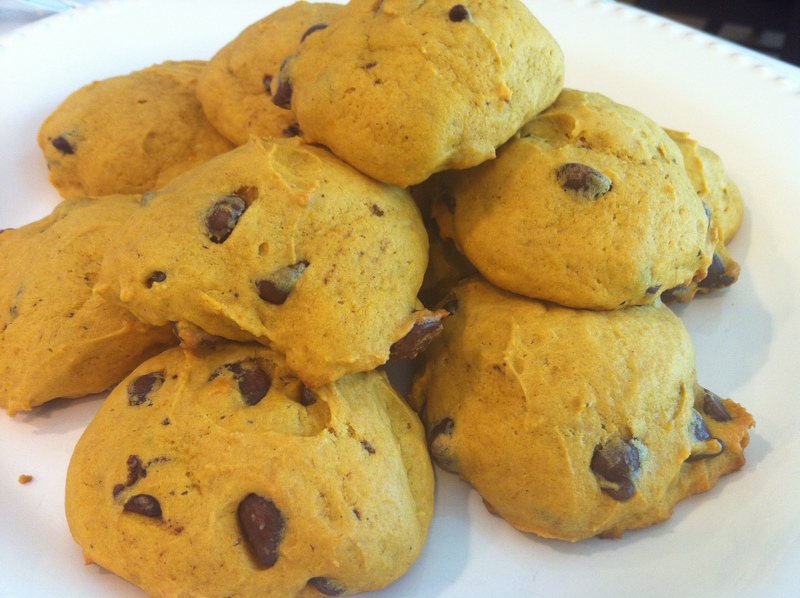 I love pumpkin and I love chocolate chip cookies so I’m going to have to try this one out. Thanks for sharing on the blog hop! How many cookies does this recipe make? It looks tasty! It makes a ton! Probably 10 dozen! Pingback: Cast Iron Queen | Homemade Organic Pumpkin Puree – It’s Easier Than You Think! !